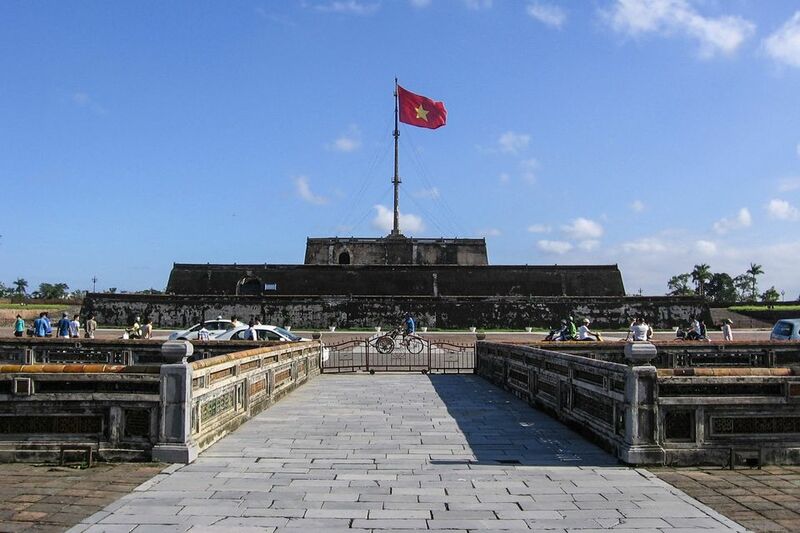 The capital of Vietnam throughout the 19th and early 20th century was Hue, in Central Vietnam. The center of the Nguyen Empire still stands - the Hue citadel palace complex, with its high stone walls and the refined palaces and temples behind them, were the center of Vietnamese governance and politics during the Nguyen Emperors' rule. The French conquered Vietnam late in the 19th century but decided to leave the Emperors in place as puppet rulers beholden to Paris. Reigning with the consent of the French, the Nguyens ruled as figurehead monarchs at the Hue Citadel till 1945, when Bao Dai turned over the reins of government to the revolutionary government of Ho Chi Minh. The Hue Citadel is about 520 hectares in size, sitting close to the banks of the Perfume River. The inner sanctum is still open to the public as it undergoes continuous renovation. Most of the buildings were obliterated during the Tet Offensive in 1967, as American bombs helped push the invading North Vietnamese troops back to Hanoi. Begin at the Ngo Mon Gate, the entry point into the Citadel across from the Flag Tower. You'll pay the entrance fee of VND 55,000 (about US$3) at the gate. The Hue Citadel is easily accessible via taxi and cyclo. They can take you straight to the Hue Citadel from your hotel. bottled water; alternatively, you can also buy water along some of the many refreshment stands within the Citadel Grounds. The gates: Two of the five entrances that cut through the thick stone ramparts serve as entry and exit points for tourists. The largest, middle gate is barred - it was reserved for the Emperor's use. The two entrances flanking the Emperor's gate were reserved for mandarins and court officials, while the outermost entrances were reserved for soldiers and war materiel. The viewing platform: the "Belvedere of the Five Phoenixes", the Emperor's private viewing platform on top of the gate, hosted the emperor and his retinue during important court ceremonies. No women were allowed at this level; from this vantage point, the Emperor and his mandarins observed military exercises and awarded examination passers. The flag tower: Opposite the Ngo Mon Gate, across the Ngo Mon Square, you can see the Vietnamese national flag flapping from the Flag Tower. The three terraces that comprise the Flag Tower's platform was built in 1807, during the reign of Gia Long. Directly in line with the Ngo Mon Gate along the Hue Citadel's central axis, The Throne Palace can be reached after walking 330 feet across a bridge known as the Trung Dao (Central Path) which crosses a pond known as the Thai Dich (Grand Liquid Lake). Immediately after crossing the bridge, you'll step onto the Great Rites Court, where mandarins assembled to pay homage to the emperor. The lower half, further away from the Throne Palace, was reserved for village elders and lower-ranking ministers. The upper half of the court was reserved for high-ranking mandarins. The Throne Palace, also known as the Palace of Supreme Harmony, was the nerve center for the Emperor's court during its heyday. Built in 1805 by Emperor Gia Long, the Throne Palace was first used in 1806 for the emperor's coronation. Over the years, the Throne Palace became the preferred setting for the Empire's most important ceremonies, like the Coronations of Emperors and Crown Princes, and receiving foreign ambassadors. The Throne Palace was built to accommodate such pomp and circumstance: the building is 144 feet long, 100 feet wide, and 38 feet tall, supported by lacquered-red columns entwined with gilded dragons. Over the throne hangs a carved board bearing Chinese characters reading "Palace of Supreme Harmony". The insulation and acoustics of the Throne Palace are amazing for a building its age. The Throne Palace enjoyed cool temperatures in the summer and warm temperatures during the winter season. And anyone standing at the exact center of the Palace - where the throne was Emperor placed - could hear sounds from any point in the palace. The Throne Palace has been diminished by time and the ravages of war: rains and floods common to Central Vietnam have damaged some parts of the palace, and serious damage was done by American bombs during the Vietnam War. Immediately behind the Throne Palace, visitors can walk past a giant replica of the Emperor's Great Seal, and enter the plaza flanked by two Mandarin's Buildings. These buildings were annexed to the Throne Palace; they served as administrative offices for the cream of the Imperial civil service, and preparation areas for important meetings with the Emperor. The national examinations (inspired by those in China) were also conducted here for students hoping to enter the Imperial civil service. The Emperor took a personal interest in the examinations - he himself awarded plum posts to the passers of the imperial examinations, in a grand ceremonial in front of the Ngo Mon Gate. Today, the buildings hold souvenir shops; the right Mandarin Building hosts a museum of Imperial knick-knacks. The Royal Forbidden City used to stand on the grassy field immediately following the Mandarin Buildings; the Emperor's private quarters stood here before American bombs finished them off in the 1960s. The Royal Reading Room (Thai Binh Lau) was the only building to survive the ravages of the 20th century. The French reoccupation failed to destroy it; American bombs failed to bring it down. Thai Binh Lau was first built by the Emperor Thieu Tri between 1841 and 1847. The Emperor Khai Dinh later restored the temple in 1921, and civil authorities continued restoration efforts in the early 1990s. In the old days, the Emperors used to retire to Thai Binh Lau to read books and write letters. Apart from the fascinating ceramic ornamentation, the surrounding structures also make the Reading Room a cool stop along the tour - a square-shaped pond and accompanying rock garden; the Pavilion of No Worry to its left, the Gallery of the Nourishing Sun to its right; and assorted galleries connecting to the building over bridges spanning artificial lakes. From the grassy field that used to be the Emperors' private quarters, turn to the southwest and you'll find a truong lang, or long, roofed corridor, that leads to a compound housing the Queen Mother's mansion: the Dien Tho Residence. The Dien Tho Residence has several important buildings within its walls: the Dien Tho Palace, the Phuoc Tho Temple, and the Tinh Minh Building. Dien Tho Palace: built in 1804 as the Queen Mother's home and audience hall, the importance of the building grew in proportion with the Queen Mother's growing influence in Vietnamese affairs. The palace was partially damaged during the wars of the 20th century but experienced significant renovation between 1998 and 2001. Dien Tho Palace's present look approximates its condition during the last Emperor Bao Dai's reign. The front apartment looks the way it did when Queen Mother Tu Cuong lived there in the first half of the 20th century, a sumptuous living area finished in dark lacquer and gold. Most of the other objects in the apartment were actual possessions of the Queen Mother's household. Phuoc Tho Temple: Located behind the Dien Tho residence this temple served as the Queen Mother's personal Buddhist temple and shrine. Here, the Queen Mother celebrated religious anniversaries and performed rituals on auspicious days of the lunar month. The upper floor is called the Khuong Ninh Pavilion. Tinh Minh Building: standing to the side of the Dien Tho residence this relatively modern-looking building stands on the site of a wooden building named Thong Minh Duong. The large, ornate gate across from the Dien Tho building exits the compound; turn right and follow the road for about 240 feet, then turn right at the corner and walk about 300 feet until you come to another beautifully decorated gate to your left - Chuong Duc - which serves as the entrance into the The Mieu and Hung Mieu Compound. Two temples still stand within the compound's walls: The To Mieu, where the Nguyen Emperors are honored, and Hung To Mieu, built to enshrine the memory of Emperor Gia Long's parents. On the death anniversaries of the emperors, the reigning emperor and his retinue would perform the appropriate ceremonies at The To Mieu. The lacquered altars in the main gallery each honor one of the Nguyen Emperors. The altars originally numbered only seven - the French overlords prevented the Nguyen emperors from installing altars to honor anti-French emperors Ham Nghi, Thanh Thai, and Duy Tan. The three missing altars were included in 1959, after the departure of the French. Take note of the yellow enameled roof tiles and the red lacquered pillars within the main temple chamber. Visitors are permitted to enter the main chamber but must leave their shoes at the door. Once inside, you won't be permitted to take photos. In front of the Hien Lam Pavilion stand nine urns - Dynasty Urns honoring the emperors who completed their reigns. The Nine Dynastic Urns were cast in the 1830s. As they represent the reigns of successive Nguyen Emperors, the urns were designed with massive proportions: each urn weighs between 1.8 to 2.9 tons, and the smallest urn is 6.2 feet high. Traditional designs representing the reign of each Emperor were chiseled onto each urn. The Hien Lam Pavilion, also known as the Pavilion of Glorious Coming, commemorates the lives and accomplishments of significant commoners who helped the Nguyens rule their empire. The gate that leads out of the temple compound stands immediately across from the Hien Lam Pavilion. Turn left, walk about 700 feet, and you will arrive where you started, at the Ngo Mon Gate.